What we feared would happen one day in this country is unfolding before our very eyes. With Prime Minister Tuilaepa Sa’ilele Malielegaoi’s administration acquiring such political power over the years turning Parliament into a one-party state, they perhaps thought they are so powerful no one would ever dare to question their decision-making, let alone stand up to them. 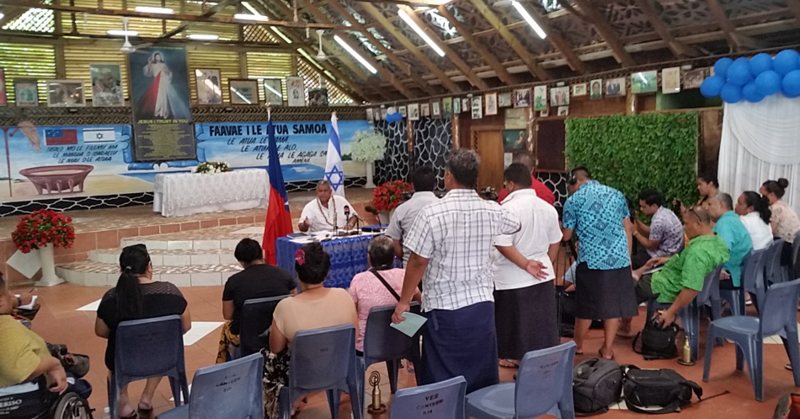 Well that was until this week when the Congregational Christian Church of Samoa, the biggest denomination in the country, flatly rejected the law requiring Church Ministers to pay taxes on their alofa (offering received by Pastors). What that has led to is an unprecedented stand off between the State and Government where both parties are eyeballing each other to see who blinks first. From an outside perspective looking in, this is great fun, especially in a country that recently declared itself an official Christian state. And here we have two of the most powerful institutions on the land taking on each other like we’ve never seen before. Who is the genius who warned that the state and the church do not mix? Didn’t somebody tell them to separate politics and church matters? Now here is the concern. When two blades of steel clash, sparks fly in all directions. That’s exactly what is happening in this case. We don’t need to be reminded about Samoa’s loyalty to their God and churches. The worry is that this confrontation is growing nasty and as sparks fly in all directions, we hope there’s no fuel leakage close by that could lead to an eruption causing irreparable damage. Since the law to tax the Head of State and Church Ministers became effective in January, the E.F.K.S. had refused to obey. They said they wanted to wait until their Fonotele this year to discuss the matter. While they were meeting, Prime Minister Tuilaepa issued a clear warning. That’s when he referred to convicted Cabinet Ministers, Toi Aukuso and Leafa Vitale who were jailed for conspiring to murder another H.R.P.P. Cabinet Minister, the late Luagalau Levaula Kamu. So what is Tuilaepa saying? That all members of the church who discussed and supported the rejection of the tax law should be charged and hauled to jail? Thousands of them too? What a scenario that would be? In any case, Tuilaepa pointed out that all other churches are supportive of the law unlike the E.F.K.S. Well that’s not what the E.F.K.S. believes. Which is what the General Secretary, Reverend Vavatau Taufao highlighted when he confirmed the Church’s rejection of the tax law. Obviously Tuilaepa and Rev. Vavatau are not reading the same Bible. Still, Rev. Vavatau said it is the right decision. How serious was he? Serious enough that he’s ready to face the consequences that Tuilaepa had warned about. Now let’s pause here for a minute and picture this. Can you imagine Prime Minister Tuilaepa sending in Police officers to arrest all those disobedient E.F.K.S. Ministers? What will church members do? They are unlikely to be happy to just sit around. And what about Police officers who are also members of the E.F.K.S. church? Will they be daring enough to arrest their own spiritual parents? This is where this dispute is heading unless a solution is found soon. The good news is that according to Rev. Vavatau, the Church is seeking an opportunity to meet with Prime Minister Tuilaepa. What happens at that meeting will determine the next development in this mighty mess. As we head to church on this Sunday, let’s pray that both parties come to their senses and end this fracas once and for all. What we need to keep reminding ourselves is that problems are not solved by confrontation, but through mutual respect, humility and the humbling practice called dialogue. Since we know that confrontation will only aggravate and destroy, it’s important for us all to learn to forgive, forget and ask what would Jesus Christ do in this situation? Isn’t that why we are called Christians?